Just as flap surgery is now considered a procedure from the dark ages of hair transplant, so too should strip surgery be given the boot. Its totally unnecessary in this day and age. It destroys any chance for a person to have the option of shaving his head if his hairloss progresses further than he thinks it will at the point of transplant. It leaves a scar. There’s a lot of bleeding. Chance of infection. Pain. Danger of shock loss. Just too many negatives. It may be time to declare a “jehad” on all strip transplant doctors. Am I wrong? I can’t see one benefit to strip surgery other than saving the doctor’s time and ruining the patient’s life. Only doctors who don’t give a f… and are looking to get on the golf course by noon are doing this kind of surgery. Strip HTs still produce a better survival yield per-graft in many cases. And strip definitely produces a higher lifetime yield of total donor grafts. At best FUE will only give you maybe 50-70% of the total lifetime grafting that strip does. The highest totals are from guys who get both methods done, but strip is the higher producing method if we’re talking one or the other. » Strip HTs still produce a better survival yield per-graft in many cases. Further to what Cal said, using a combination of both methods is the only way you can maximize your donor hair availability to get the highest # of grafts possible. I will never do a strip transplant. A person with MPB will lose hair throughout the rest of his life. I need to preserve the option to shave my head and look like Mother Earth if it comes to that. The last thing I would want is for my hair to fall out some years after a transplant and then not have the option to shave my head. It will look ridiculous having a few transplanted hairs still around while everything else is going going gone. I’ve seen one guy who had a strip transplant decide to shave his head. There was an unsightly scar running like a large smiley face across the back of his head. It looked like he’d been cut open in some Frankenstein experiement. » I will never do a strip transplant. » else is going going gone. » I’ve seen one guy who had a strip transplant decide to shave his head. Strip is necessary for higher yield and number of grafts esp in advanced nw cases! There is scarring with FUE as well. Each unit extracted leaves a small but visually detectable “dot” of scar tissue. » » I will never do a strip transplant. » » comes to that. » » else is going going gone. » » I’ve seen a few guys like this and you can spot them a mile away. » » I’ve seen one guy who had a strip transplant decide to shave his head. » but visually detectable “dot” of scar tissue. I forgot the name but I swear some fue doctors claim that there is no scarring, speaking of scarring, can someone post a picture of someone who had fue and later on shaved his head? It’s good to have the option to go bald naturally further down the road if one day I no longer want to fuss with my hair loss problem. Is it true that there are scars with FUE? Can anyone prove / disprove that claim? 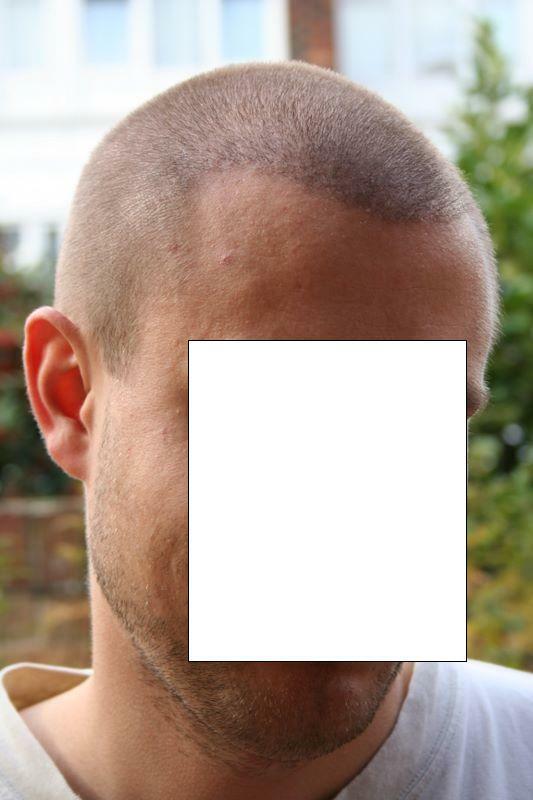 Does any one have pictures of a guy who underwent FUE and subsequently shaved his head after he has healed? Are the spots visible. If they are, I won’t want a hair transplant even if its FUE. I need to preserve the option of shaving it all off. A round bald head may be an embarrassment for a small amount of time. But eventually people will get used to it especially if you buff up. It might actually look good for some people. But with a bad transplant, nobody will ever get used to it. » » » I will never do a strip transplant. » » » comes to that. » » » else is going going gone. » » » I’ve seen a few guys like this and you can spot them a mile away. » » » I’ve seen one guy who had a strip transplant decide to shave his head. » » but visually detectable “dot” of scar tissue. » with my hair loss problem. I’ve seen both bad dot scarring and hardly any noticeable scarring whatsoever with FUE. There are many case studies with photos on this forum to search out. IMO, this all depends on the docs technique, punch size and most importantly, the patient’s own healing characteristics. Some people just scar worse than others. I’ve never had head-hair FUE but I had over 1000 grafts taken from my legs and there is no sign of the procedure at all. I live in Cali and wear shorts 10 months a year. Not a trace of all those incisions. P.S. Kudos to the moderator for not banning YOU for posting this. I was banned on another site for posting this exact type of opinion, only I included pictures of a strip procedure in progress. If I had seen those pictures in 1992, I may never have had that procedure performed, regardless of my results. This argument has been long overtaken by reality, sorry. I know it is hard to accept if something is embedded. FUE will always yield more grafts since it has no limiting laxity factor. You are right about total maximal yield; both procedure can provide more. What about the reality of you getting caught making deceptive posts about your clinic’s results? I agree. Strip only strips your scalp. It is outdated, archaic and will leave your scalp in a mess. F.U.E. by the best surgeons is the only way to go. I have had both and the old punch graft method as well as flaps and scalp reductions. I’ve had them all. Only insist on F.U.E. I agree, I’ve had strip 4 times (1 scar) from 2 terrible clinics, and I’d rather have lots of bad fue scarring than 1 strip scar. I’ve had fue into my scar which is only 6 months post op atm, so I’m hoping for a lot more growth, seems to of made a positive difference so far, but it still visible at short length. The patient discussed on the link had a bad strip surgery in Italy. He visited us and got FUSE grafts transplanted from the beard and scalp donor. On his 2nd visit, he was keeping a buzzcut. » scalp reductions. I’ve had them all. Only insist on F.U.E. what bout getting maximum out of donor and yield?? I would agree that strip for a virgin scalp is a bad idea unless you’re really old enough to have your pattern established and know how you will always wear your hair. If you’re a 27yo guy who only needs 2000 grafts then I would definitely advocate FUE first and save your choice to buzz down. I agree that even bad FUE scarring is less objectionable than a good strip scar for buzzing down. But a good strip session will generally outdo a good FUE session for raw transformation. The strip work allows much more grafting at one time and a somewhat higher percentage of the grafts tend to live. IMHO you probably can’t get the hairline quite as ideal with strip as with FUE. Strip grafts come from the thickest-shafted hairs on your head. An FUE doc can soften the hairline with thinner shafted neck hairs. So even the best strip work may benefit from a few hundred FUE grafts onto the hairline. » somewhat higher percentage of the grafts tend to live. This is again outdated information, sorry. But I can understand your point of view because you are probably located in the US. Please understand that in Europe FUE has advanced much faster than anywhere else in the world. Probably this is to be explained because for historical reasons there where many bad strip surgeries in the past and this has scared people. Nowadays you will find that FUE is offered more and more. Especially in the Belgium you will see more FUE work being performed than strip. Our team is training other docs and assistants into the art of FUE. Why, because demand for FUE is so high that in the near future it will become impossible to offer acceptable waiting times for patients. Last time I visited the Ishrs drs agreed that the survival of good FUE equals that of Good strip and vice versa. This debate is therefore closed. Stop staring yourselves blind on the showcase patient that receives 4000-5000 strip grafts in a single session. These are EXCEPTIONS OR GRAFT COUNTS have been artificially increased by splitting grafts. Most strip Docs would agree that the average strip sessions yield about 2500-3500 unsplit grafts. Surprisingly or not, but this is in the same number range where FUE megassesions are today as well (obviously it may require 2 consecutive days instead of 1, admitted).